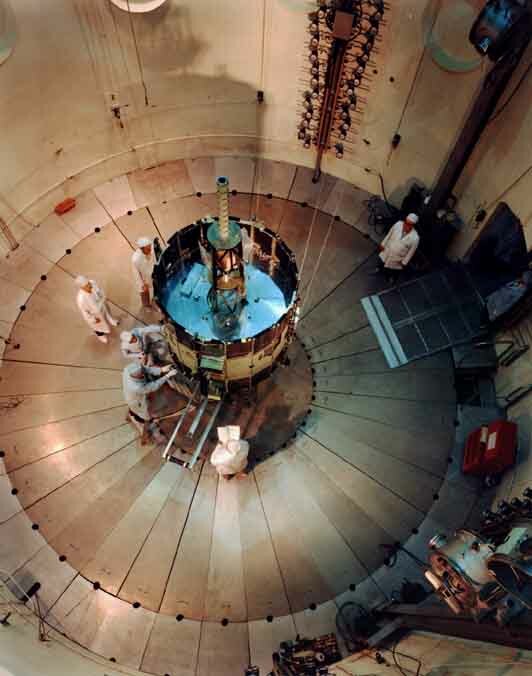 The ISEE-C undergoing evaluation in a dynamic test chamber at Goddard. On the night of October 4, 1957, a large rocket lifted off from its pad at a remote, secret installation in the Kazakhstan region of the U.S.S.R. In its nose cone was a 22-inch diameter sphere weighing 175 pounds.1 A few minutes later, the rocket disappeared from sight. But the reverberations from that launch were felt more than half a world away. Almost two hundred years after the Battle of Lexington and Concord, another shot had been heard around the world. And it, too, would change the course of history. ....an unprecedented level of support for an entirely new field of science - one that would explore what lay beyond the atmosphere and give us a new perspective on Earth itself. The sudden boom of the space age, however, brought with it an acute need for new infrastructure to organize and manage projects that would involve thousands of people and millions of dollars. The National Advisory Committee for Aeronautics (NACA) had several aeronautical research centers around the country, but the size and scope of their projects were much smaller than the large-scale "big science" efforts a space program would require. As plans for the new National Aeronautics and Space Administration (NASA)2 progressed throughout 1958, decision-makers realized there was a need for new research centers devoted expressly to space projects. This realization led to the creation of the Goddard Space Flight Center - NASA's first research center created specifically to support the space program. Over the past forty years, the Center has grown from a small collection of scientists and engineers trying to solve the basic problems of space flight into a remarkably diverse organization supporting and pursuing an ever-widening range of scientific research that rockets and satellites have made possible. In many ways, the history of Goddard reflects the history of the space program itself. The center was formed at the same time as the new space agency, and its evolution has paralleled that of NASA. If Goddard has always been a complex Center, incorporating many diverse disciplines and groups, it's because the exploration of space itself was a complex challenge that required many different people and resources. A single scientist might conduct a wide range of experiments in a lab, but getting a satellite into space required support from government, industry and universities, scientists, technicians and engineers, and a tremendous amount of money. Balancing these different, and sometimes conflicting, resources has remained one of the major challenges not only for Goddard, but also for many people in the space program. At the same time, what has allowed Goddard to succeed; to overcome the many obstacles that stood in its way, especially in the early days of space flight, was the same unbridled enthusiasm that took us to the Moon in less than a decade. Engineers and scientists did not go to work for Goddard or NASA for the money. They went to work there because they were fired up with excitement over the prospect of exploring a frontier no human had entered before. The challenge of space was bigger, tougher, and more awe-inspiring than any endeavor humankind had ever undertaken, and to work at NASA was to work on the cutting edge of the action. Technicians prepare multimission modular component for the Space Shuttle cargo bay. ....Goddard with a kind of youthful energy that resisted authority but excelled in innovation. The scientists and engineers who came to Goddard were young, energetic, fired up with a passion about space and willing to overcome whatever obstacles they had to in order to explore it. This passion was important, because space was not a place for the fainthearted. A scientist might devote three, five, or ten years to an experiment only to have the launch vehicle carrying it drop into the ocean. To stay with such an uncertain and sometimes discouraging field, one had to have an enormous amount of enthusiasm and dedication for the work. This enthusiasm became one of the defining characteristics of Goddard, especially in the early days. Employees not only worked together but played together, staying after work for volleyball games, recreation, and Center-sponsored drama club productions. The employees worked and played hard, making the Center not only their place of work, but almost their place of residence. Long hours and seven-day weeks were taken in stride - something that allowed great progress to occur, but probably caused the sacrifice of more than a few marriages in the first decade of the space program. Mission Planning at the Goddard Space Flight Center. Goddard's place as the first space center also has given it a unique legacy in terms of the sheer scope of the work that it does. Goddard was formed when the space program was in its infancy and, as with many entrepreneurial organizations, the Center had to wear many hats. The number of projects involved in the early space effort was still small enough to be managed by one center, and even NASA managers did not quite realize yet how huge the space program would become. At the time Goddard was formed, there was also no other space center to share its responsibilities. The Jet Propulsion Lab (JPL) in Pasadena, California had been incorporated into NASA at the same time Goddard was founded, but JPL was given the task of managing planetary missions, not Earth-orbiting satellites. As a result, Goddard initially was given responsibility not only for theoretical physics research to support space science, but also for all aspects of satellite development and operation, from project planning and development of instruments to fabrication and testing of the satellite itself, launch vehicle development, tracking and data analysis. The Center initially even had responsibility for the manned space flight program.4. While the astronaut program never actually took up residence at Goddard, the Center has retained some level of responsibility for the vast majority of NASA's unpiloted, Earth-orbiting satellites. Over the years, Goddard also incorporated the management of several other facilities and projects, including the world- wide manned space flight tracking and communications network during the Mercury, Gemini and Apollo eras. Today, the Center's responsibilities still include a separate Institute for Space Studies in New York, a satellite tracking and data facility at the White Sands Missile Range in New Mexico, and the Wallops Flight Facility in Virginia, which has always served as one of the primary locations for the launching of sounding rockets. The scientific component of Goddard also gave it a different organizational personality than most of the NASA Centers. Most of NASA's aeronautics and space centers have focused on applied engineering tasks or research of one kind or another. Aeronautics has always been an engineer's field, and the human space flight program was fundamentally an engineering challenge until the Space Shuttle began to carry more scientific payloads into orbit. Goddard, on the other hand, focused primarily on space science efforts. The development of technology and the engineering accomplishments involved in getting satellites into orbit - while important contributions and a significant percentage of Goddard's work over the years - were not the sole goal of the Center. Most of Goddard's spacecraft were a means to an end; the tools that allowed scientists to get instruments up into space. 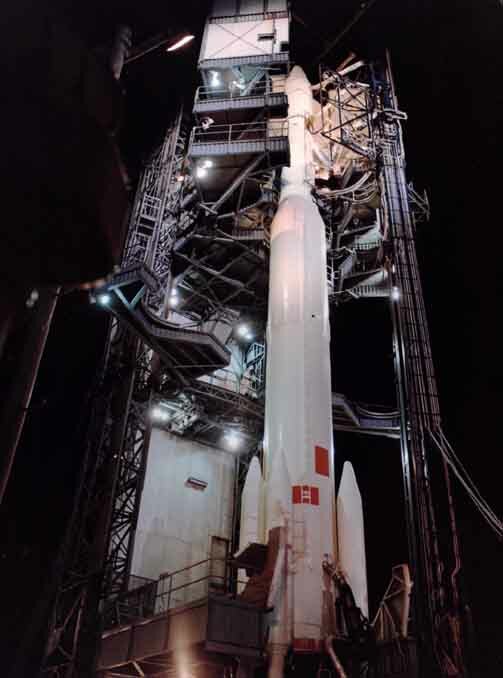 A Delta rocket stands ready to launch an ITOS weather satellite. Development of both the launch vehicle and satellite was managed by Goddard. (NASA photo 71-HC-1182). This mix of engineering and science has always been one of the unique characteristics and strengths of the Goddard Space Flight Center. But it also presented a challenge for managers who had to incorporate scientists into an organization accustomed to working with engineers. The academically oriented scientists who came to work at Goddard tended to have a very different working style than their engineering counterparts. The scientists were used to working independently, with more flexible deadlines and schedules. Engineers, on the other hand, were more accustomed to team efforts and a more structured work schedule and environment with milestones, deliverables and fixed budgets. Goddard's managers had to find a way to accommodate both physicists who did their best  work at two in the morning as well as the more structured needs of a space research program that had firm launch dates, test points, schedules and budgets to meet. 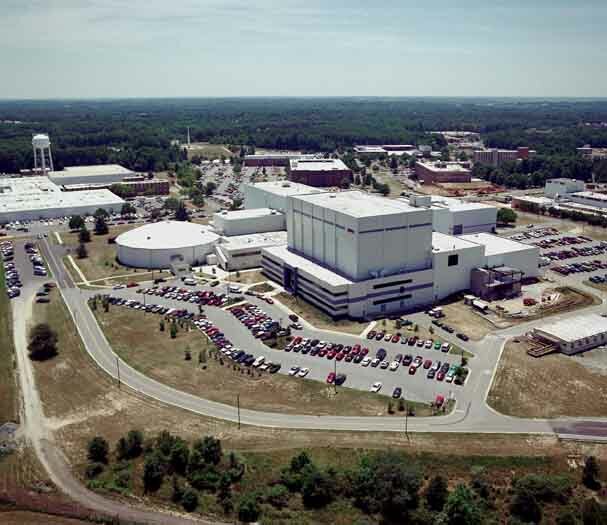 The scientific focus and culture at Goddard also complicated its relations with both NASA Headquarters and the outside community. The individual research or "field" centers, even within the NACA, were known for their independence and resistance to central authority. In some senses, this tension between NASA's field centers and Headquarters was no different than that experienced by any organization with a similar structure. Headquarters personnel, by definition, have different agendas and burdens than staff working out in the field, whether they are managing a corporation, a government agency or a diverse university system. These different perspectives and job responsibilities often cause friction between Headquarters and field personnel. 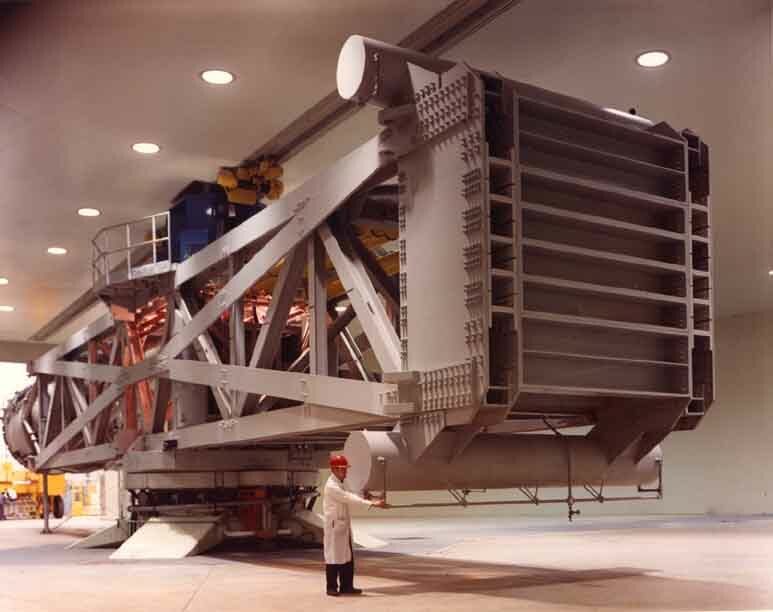 This monstruous machine is Goddard's Launch Phase Simulator. It was designed to simulate the vibration, G-forces, and changing pressures a spacecraft would have to endure during its launch into orbit. It was this kind of thorough testing that gave Goddard satellites their remarkable sucess record. (NASA photo 6906313). The scientists wanted to be left alone to do their research. But space science was an expensive endeavor, and taxpayers were footing the bill. So managers at NASA Headquarters were under constant pressure to provide information to Congress on the status and progress of different programs. As a result, there was a continual conflict between Headquarters' desire for first-hand, up-to-date information and researchers' desire to be left alone. 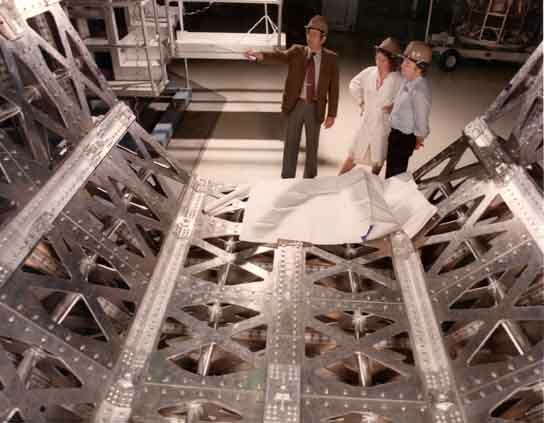 Goddard personnel oversee construction of a pallet for the Space Shuttle cargo bay. These pallets are used to hold satellites and other scientific research equipment. (NASA photo G-79--074542). ....focused on applied engineering research, and their primary customer was the commercial aviation industry. NACA/NASA researchers would publish the results of their work in technical reports that industry engineers would use as reference guides when designing new aircraft or engines. The relationship was fairly smooth, because NASA researchers were providing a service that industry appreciated. By the same token, NASA's human space flight program was essentially its own customer. Scientific satellites faced a different situation. The primary customer in space science was not a commercial industry, but an international scientific community, and the product was not a practical piece of technology but a more esoteric piece of knowledge to fit into a evolving picture of the universe. The situation was complicated by the fact that scientific and astronomical research, as opposed to human space exploration, was not exclusively NASA's domain. As a result, Goddard has always had to maintain a delicate balance between supporting research conducted by its own scientists and supporting the needs and desires of the external scientific community. 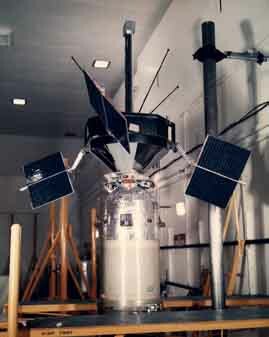 Explorer XIV, launched in October 1962, was designed to investigate solar wind and radiation phenomena. ....groups in the peaceful application of space."7. While these partnerships have been extremely fruitful over the years and are more prevalent than ever in today's global environment, international projects were more complex to manage. 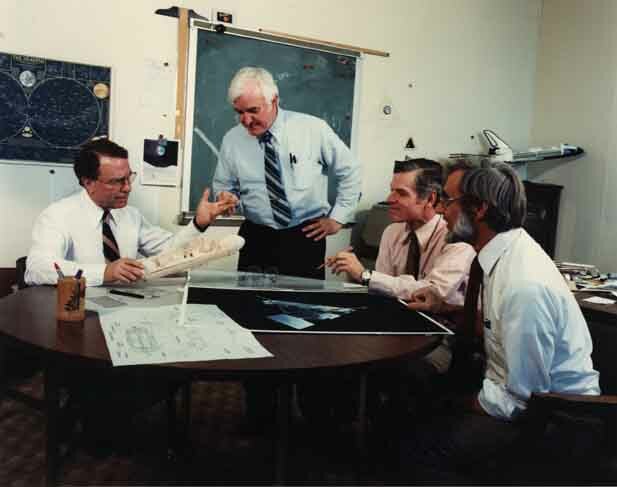 Goddard's diverse responsibilities and communities certainly created some unique management challenges, but its diversity created some important strengths and capabilities within the Center, as well. Goddard was one of the only places in the world where the entire cycle of a space science experiment could be conducted. The Center had sufficient in-house resources to develop the theory behind an experiment, carry out the experimental design and engineering necessary to determine if it was feasible, fabricate and test the instruments and spacecraft, provide a launch vehicle, launch and track the satellite, and collect and analyze the data sent back from space. This data would then feed additional theoretical studies, sparking yet another cycle of experimentation. This unique ability to take an experiment "from womb to tomb" has been one of the hallmarks of the Goddard Space Flight Center ever since it began. Because Goddard had responsibility for building instruments and spacecraft as well as conducting scientific research, the Center also developed a remarkable in-house ability to imagine and build new kinds of instruments, satellites, and technology. Goddard's Explorer series of satellites, which conducted experiments in almost every facet of space science and became one of the most successful series of spacecraft in NASA's history, were a product and a primary example of this in-house, innovative spirit. Goddard's engineers were also constantly looking at ways to improve basic spacecraft design. Very soon after the first satellites reached orbit, Goddard engineers began work on standardized, modular spacecraft that would be more cost-effective and easy to upgrade The first of these, the Orbiting Geophysical Observatory (OGO), was launched in 1964 Goddard expanded this concept in the early 1970s with its Multi-mission Modular Spacecraft (MMS), which was designed to be repaired in space by Shuttle astronauts. 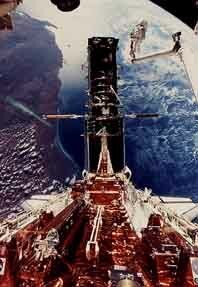 The concept was tested in 1984 when the Solar Max satellite was successfully repaired on station. Because of Goddard's previous success in modular, servicable spacecraft,the Hubble Space Telescope was also designed to be serviced on station - a design characteristic that took on critical importance when a flaw was discovered in the telescope's primary mirror. The  award-winning effort that repaired the Hubble telescope was the culmination of 30 years of innovative, pragmatic engineering efforts at Goddard. And as we approach the millenium, Goddard's engineers are continuing this innovative and pragmatic tradition as they develop new spacecraft technology and a new class of smaller and yet more capable Explorer satellites. At the same time, Goddard's roots as an "all-purpose" space center created a broad base of scientific capability that allowed the Center to expand its research efforts as technology improved. Space science efforts moved from simple particle and field research into visible, ultraviolet and high-energy astronomy, taking on more and more complex and difficult problems in all of these areas as technology and knowledge advanced. Weather and atmospheric satellite research expanded into an entire new field of Earth Science and remote sensing research. And Goddard's early work in communications satellites gave the Center the expertise to manage the development and operation of the space-based Tracking and Data Relay Satellite System (TDRSS) that now provides communication and tracking services for almost all Earth orbiting satellites, including the Space Shuttle. These diverse technical and scientific strengths have allowed Goddard to make tremendously significant contributions to knowledge and space technology. In addition, while its range of projects and responsibilities has meant that it was never the single or top priority of any one manager at NASA Headquarters, Goddard's diversity has made it less vulnerable to cutbacks or cancellation of any given role, mission or program. 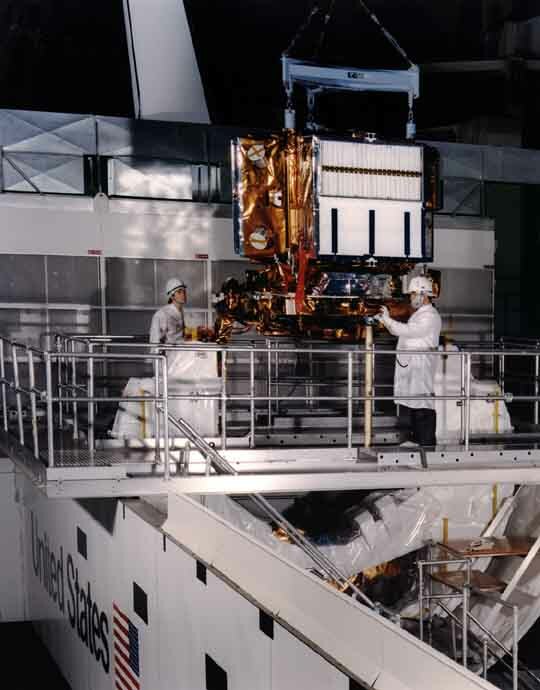 One of the most challenging missions undertaken by Goddard was the 1993 first servicing mission of the Hubble Space Telescope, which had a flaw in its primary mirror. (NASA Photo 94-HC-26). Many things have changed at Goddard over the past 40 years. The Center has grown from humble beginnings in borrowed offices and a Naval Research Laboratory warehouse to a sprawling campus with a workforce of 11,800 people and more than 30 buildings. The basic challenge of getting into space at all has long since given way to the ongoing challenge of going further and doing it more cheaply, quickly, and efficiently. 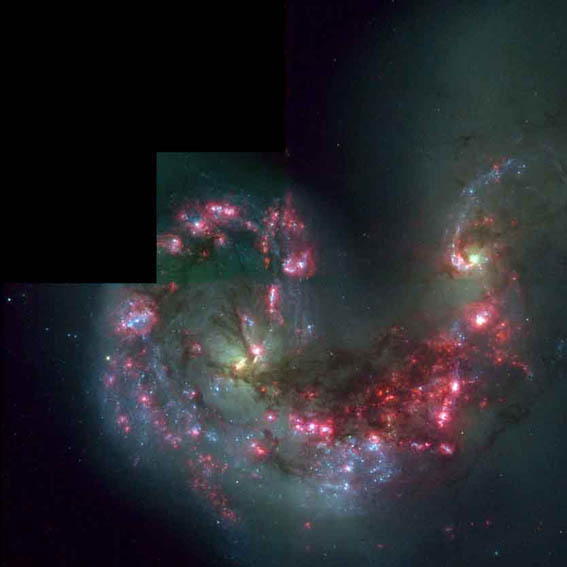 An image from the Hubble Space Telescope captures the stellar fireworks of two galaxies colliding. (NASA Photo PRC97-34A). ....a major accomplishment, we now find ourselves looking at breathtaking images of the Sun and distant galaxies, in wavelengths and detail our atmosphere had always hidden from view. In the early days, Goddard's experiments were simply trying to find out what existed in the space near Earth. Today, they are reaching back to the dawn of time to answer some of the biggest questions about the formation of our universe. At the same time, Goddard's efforts in the field of space applications, which included not only weather and communication satellites, but also Earth resource imaging satellites, have helped create several thriving industries and a growing field of Earth science research . If phrases like "El Nino" and "ozone layer depletion" are now household terms, it is in large part because of research conducted at or with the Goddard Space Flight Center. Without question, Goddard has had to change, adapt and reinvent itself and its mission to meet the changing times and priorities of the country. But the changes have been more evolutionary than revolutionary. As the NASA research center primarily responsible for Earth-orbiting satellites, the Goddard Space Flight Center's  mission has remained one of exploring the heavens and the Earth in order to improve our lives and our understanding of the universe in which we live. The satellites have become more capable and complex, the players have changed, and the goalposts have moved outward. But the mission, and the challenges inherent in that mission, have remained essentially the same. Ever since it opened its doors, Goddard's biggest challenge has been to balance its complex array of activities, groups, external communities, and concerns while reaching beyond the limits of Earth. What has allowed it to succeed at that challenge is an enthusiastic spirit and entrepreneurial personality that has characterized the Center since its beginning. It was started by young scientists, engineers and technicians inspired by the possibilities of space and willing to overcome whatever obstacles stood in the way of exploring it. Goddard is a place where people have a passion to find out more about how our world and universe work; to reach outside the boundaries of our planet to gain a better perspective on Earth and a clearer view of the galaxies and the cosmos beyond. Because of people like those at Goddard, who were willing to persevere through the rigorous demands, problems and frustrations of space exploration, we have discovered many new lands. But the journey continues, because the ocean of space still stretches before us. For every question we have answered - every new land we have discovered - there are a thousand left to understand. This is still the mission, the passion, and the driving life force behind the Goddard Space Flight Center. Forty years after its founding, its researchers are still probing the mysteries of a territory that has proven to be the most complex and challenging frontier we have ever endeavored to explore. 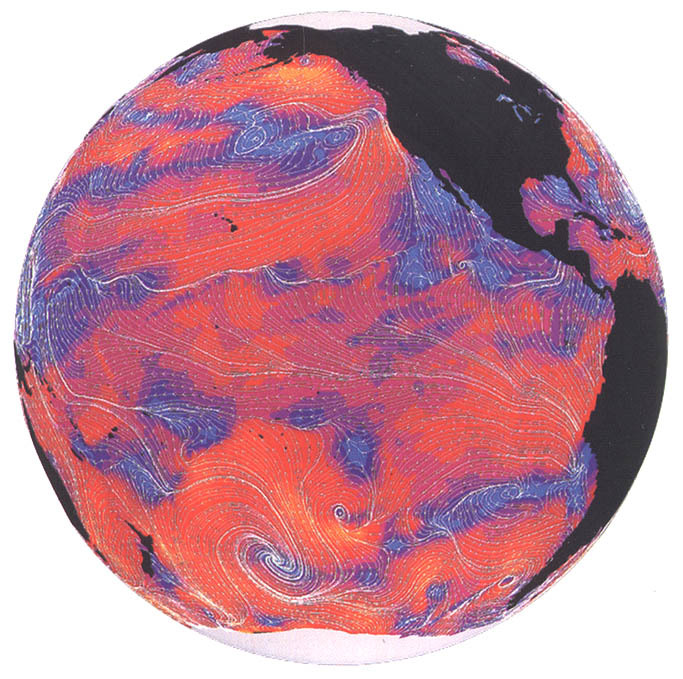 A graphic image of ocean wind currents compiled from satellite data.